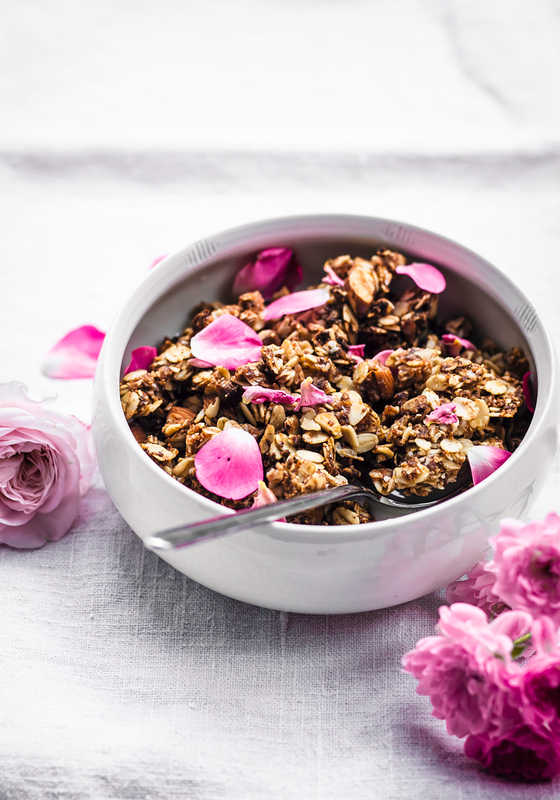 This dreamy vegan, gluten free, and sugar free almond cardamom granola is sweetened purely with dates and is inspired by Persian sweets, flavoured with rosewater and rose petals. It’s been a while- I was really sick in the week leading up to our trip to Sweden and couldn’t even look at food, never mind write about it! I decided to take some time off while we were on holiday, and since we’ve been back I’ve been working on freelance projects that I wasn’t able to do before being away. Now we’re off to Canada for the summer on Monday and I’m freaking out because there’s so much to do. But I have a guest post lined up over the summer and I’ll be working from my mom’s kitchen (she’s thrilled, hah, not) so we’ll be seeing more of each other over the next couple of months. Aaaand, maybe you noticed my brand new logo! My friend Brooke is an illustrator and she designed and drew it for me. I’m in love. 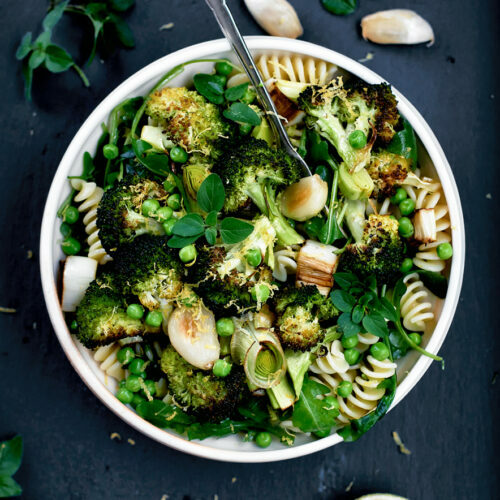 I wanted it to show that this blog is more about plants than anything else, and plant-based recipes, but sometimes there are eggs in the mix, and I think she really nailed it. You can find out more about her work on her website. About this granola. I’ve had the idea written down for ages, mostly because I thought it would make a pretty photo, but it’s so much more than that. 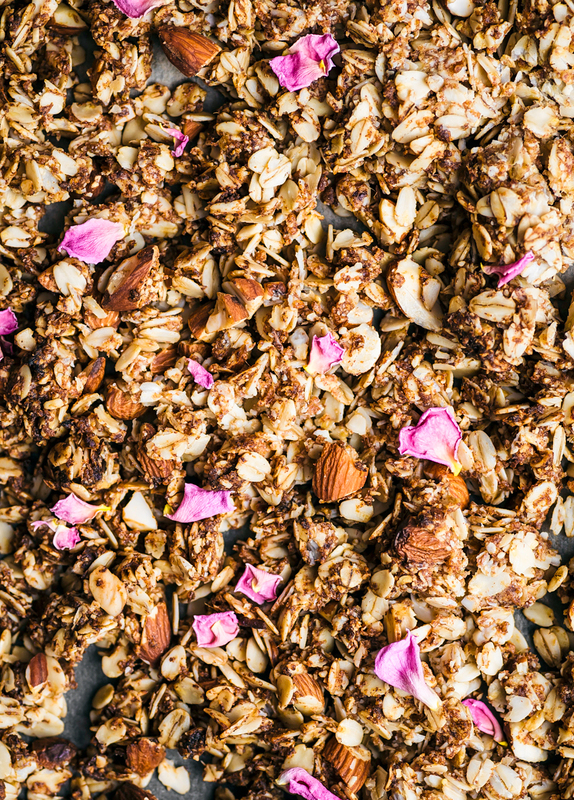 This is sugar-free granola, sweetened only with dates. 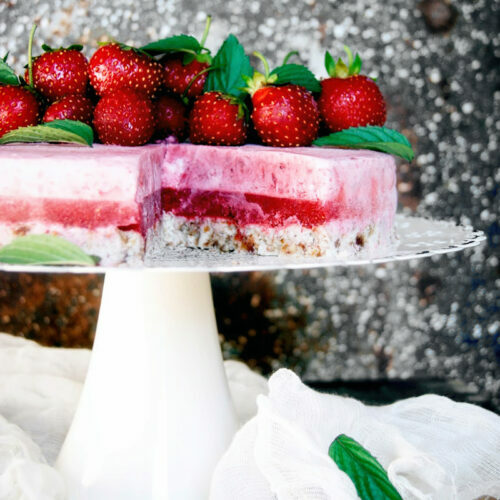 You know I’ve been really trying to reduce my sugar intake lately and I think it’s good for just about everyone to eat a little less sugar. Dates still contain sugars but since they’re fruit you’ve also got fibre and vitamins in the mix so it’s a better option, albeit not a perfect one. Moderation. 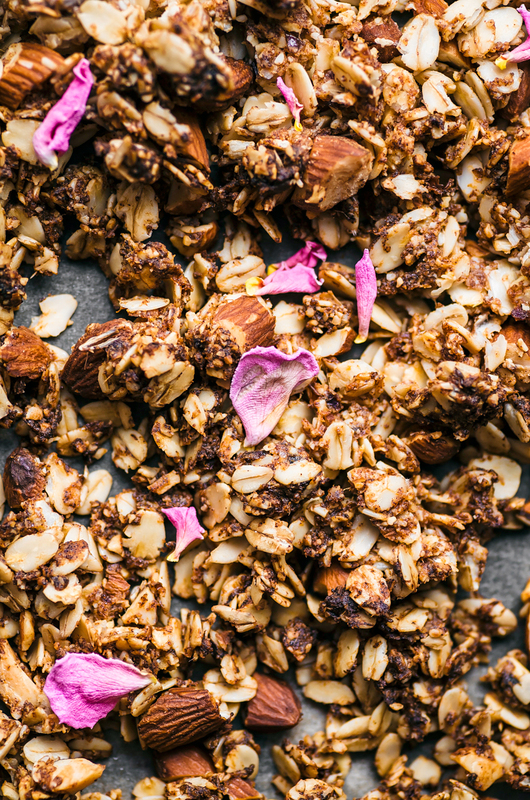 Most of my other granola recipes use maple syrup or honey – if you’re good with that, you can check out my olive oil granola, cinnamon & hazelnut, and orange tahini versions. All of them are long time favourites but this rosy date one is my current obsession. Almond meal and chopped almonds bulk things up here and add lots of protein, oats round it out, and rosewater and cardamom add some delicate flavour without being overwhelming. (Don’t add more rosewater than recommended unless you want a soap-flavoured breakfast.) Using the base of almond meal and oats makes it gluten free, and a little coconut oil along with the dates hold everything together and keep it vegan. 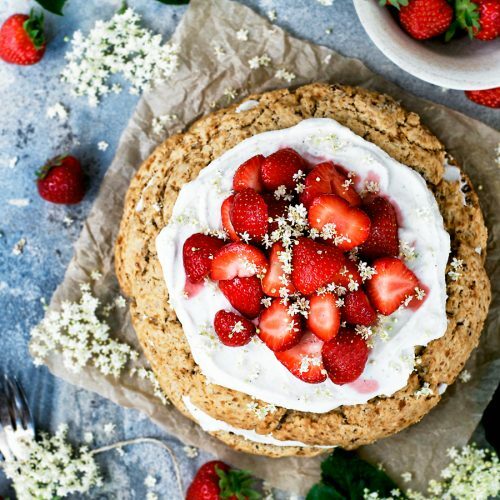 No butter or egg whites needed. If you like chunky granola, I got you. It’s all one big piece after baking and you can just break it up into larger pieces after coming out of the oven. Homemade granola is the easiest thing ever and way cheaper than over sweetened store bought versions. 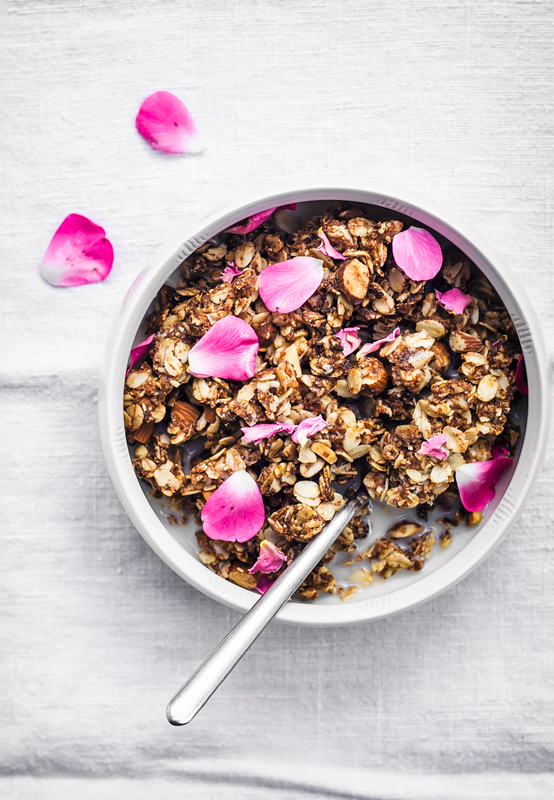 This rose & cardamom granola is crazy good for you and tastes pretty great too. 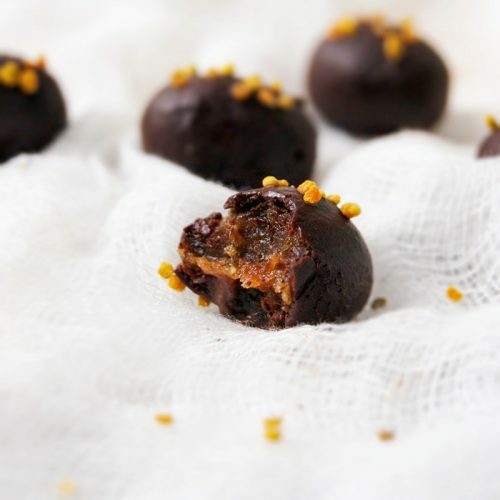 I usually use a food processor to make the date paste for recipes like this, but my dates were so soft this time that I just mashed them with a fork. If you don’t have a processor, you can do the same. And resist the urge to melt your coconut oil before adding it! Mixing it in solid (slightly softened if you gotta) will give you a better end texture and it’s fun to squish when you mix the granola with your hands. Dates tend to burn easily so the oven temperature stays low to prevent that, and you take the granola out when it’s golden, even if it feels a little soft still. It’ll crisp up as it cools. 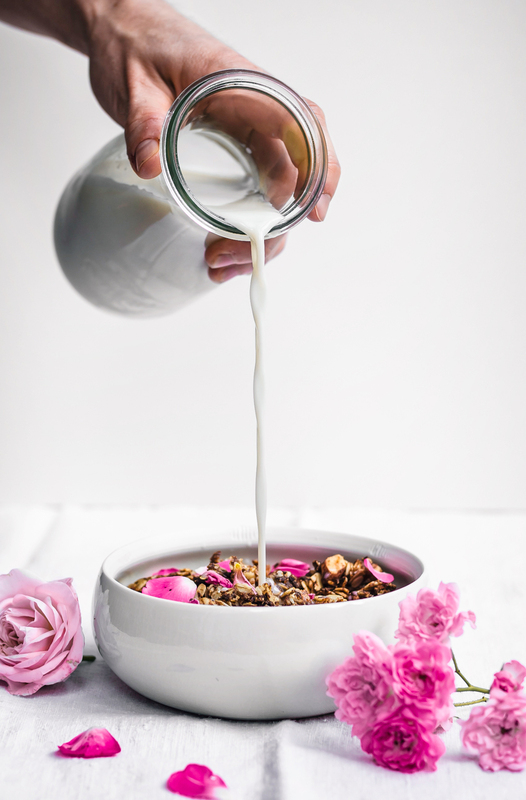 This vegan, gluten free, and sugar free almond granola is sweetened with dates and is inspired by Persian sweets, with rosewater, rose petals, and cardamom. Preheat the oven to 150C / 300F and line a large baking sheet with parchment paper. Mash the dates (remove any seeds first) with a fork or use your food processor to blend them into a paste. In a large bowl, mix the oats, chopped almonds, almond meal, vanilla, cardamom, and salt. Add the date paste, coconut oil, and rosewater to the oat mixture. Use your hands to mix until fully incorporated. 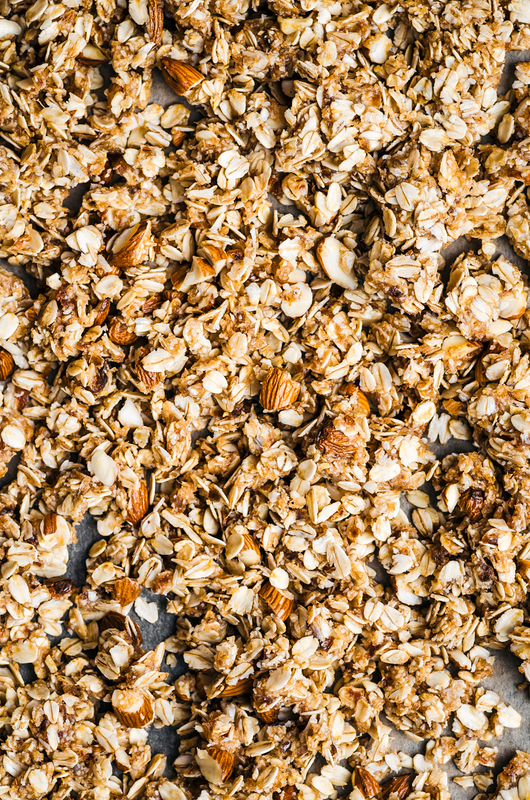 Place the granola onto the prepared baking sheet and try to spread it into an even layer. Bake for 20-25 minutes, or until golden. 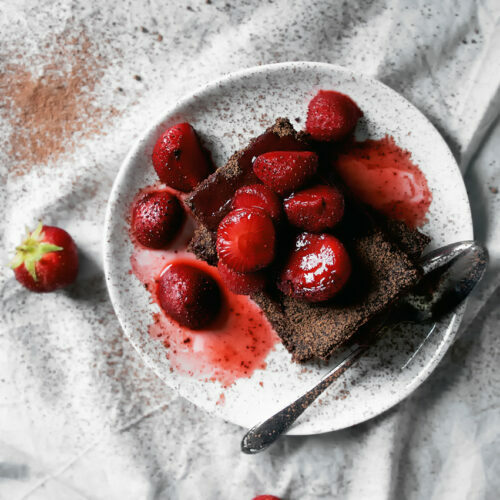 Remove from the oven and cool completely on the baking sheet before breaking into pieces and mixing in the dried rose petals. Store in a sealed container in the refrigerator for up to one month.